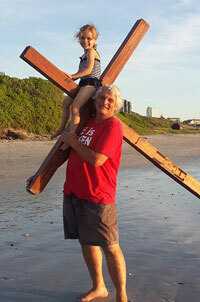 Residents’ interest would have been piqued by a man shouldering a large wooden cross around Hout Bay last week, an undertaking he says is “God’s will”. 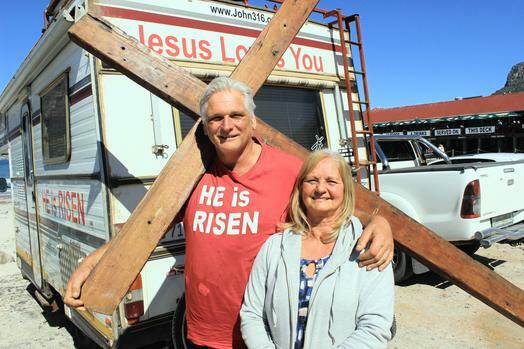 For the past two years, Johan and Winnie Marais have been traversing the Western Cape and other parts of the country in their camper van, spreading awareness about the Gospel. On reaching a destination, Johan will walk with the cross, weighing more than 30kg, to remind people that Jesus died for their sins. The Sentinel caught up with the couple on the beach on Friday September 1, shortly before Johan was scheduled to begin his afternoon “pilgrimage”. “A few years ago, I asked God, ‘What more can I do for you?’ The Holy Spirit came to me, and told me that I should make a cross and walk to all the towns of the Western Cape, reminding people what Jesus did for them,” he said. While Winnie was initially sceptical of what it was God wanted the couple to do, a stroll on Bloubergstrand convinced her that her husband’s calling had to be answered. She came across a stone on which a perfectly formed cross motif had formed and she took this as a sign. Since then, the couple have travelled to many parts of the Western Cape, including Fish Hoek, Cape Winelands, Klein Karoo, the Atlantic Seaboard and Cape Town CBD, spreading their message. They have also visited Pretoria and KwaZulu-Natal. The couple can spend anywhere between a few hours and a month in a specific location, “depending on what God required of them”, Johan said. On some occasions, Winnie will walk alongside her husband as he carries the cross, which is fitted with a small wheel at its base. At other times, she will stay in the camper van praying for the town in which they find themselves. “People are generally receptive of us, but some people do call me crazy and show me signs as I walk. I don’t let that bother me. I do have books and tapes I offer them, and it’s fine if they don’t accept. The Gospel can’t be forced on you,” Johan said. Recently, the couple acquired a tent and public address system, enabling them to preach to people more effectively.